Is your mattress no longer comfortable? Or, have you worn out the mattress topper that was incorporated into your mattress? Whatever reason you may have, a gel mattress topper is an affordable way to improve your sleeping experience. To help you figure out the best gel mattress topper for your purposes, I have put together this handy guide. There are several mattress toppers to choose from in the bedding industry today, but one option that continues to be valued above all others is memory foam. However, plain old memory foam has come a long ways in recent years, including using gel. When gel is used in a mattress topper, it is almost always used in conjunction with memory foam. So, to understand the benefits of gel mattress pads, we must first look at the advantages of memory foam. Memory foam is generally made of a unique material called polyurethane. This is a comfortable, special material that is created using a combination of millions of spherical and open cells. These cells respond to heat and pressure. Thanks to its reflex and compression functions, it offers more conformity to the contours of your body. Another benefit to most memory foam toppers is the wide selection. Memory foam pads come in several different pressure and density ranges. Most experts agree that the best density for a memory foam mattress topper is four or five pounds though you can find others that are outside of that range that work perfectly fine. The biggest complaint with standard memory foam is that it traps heat. This can lead to tossing and turning and an overall uncomfortable night sleep. Gel memory foam was introduced to address this problem. What Sets Gel Memory Foam apart? All of the properties of memory foam are found in gel mattress toppers. In addition, they have cooling gel beads. By bonding with the foam, these tiny beads allow more airflow to regulate the temperature of the mattress pad throughout the night. Another advantage to using gel mattress toppers is that the gel beads give more strength to the foam. This keeps you from sinking into the mattress topper too much. What Size Pad Should You Get? It may seem pretty easy to pick out what size gel mattress topper to get, but consumers often make mistakes by neglecting to measure their bed. Unless you have purchased your mattress recently and are certain of what size it is, I would strongly recommend measuring your bed before buying a topper. The most popular sizes are twin beds, which are 39” by 75”; full beds, which are 54” by 75”; queens, 60” by 80”; kings, 76” by 80”; and California kings, which are 72” by 84”. The position that you typically sleep in will determine the best mattress topper thickness for your needs. You need to be certain that mattress topper thickness you pick enhances your comfort when sleeping. For instance, a three-inch pad will improve your comfort if you usually sleep on your side or back. On the other hand, a two-inch topper is preferable if you sleep on your stomach. In general, two-inch memory foam toppers are ideal if you have below average body weight or are small. Pads of this thickness help relieve your body with medium pressure while you sleep. They are often the most affordable. And, the comfort level of two-inch thick pads is about three out of five. Three-inch gel memory foam mattress toppers have an above average comfort level of about four out of five. They supply excellent pressure relief for joints and back pain. This thickness is the most popular among consumers. You can get a lot more support from four-inch gel mattress pads. However, they also tend to be on the pricier side. Nonetheless, they are the favorite choice for sleepers who weigh more than 250 pounds. It is crucial that you learn about the materials that are used to make your gel mattress topper. Is it made of hypoallergenic materials? If so, you can be protected from having an allergic reaction. Plus, it protects against dead skin and body oils that could penetrate the pad. With most gel memory foams, you will experience a rather unpleasant odor when you first unwrap it. This is known as “off-gassing,” and it is perfectly normal. The chemicals used throughout the manufacturing process produce this odor. For the most part, these odors will last a couple of days though there are rare instances of it taking several weeks for the smell to go away. I recommend putting the memory foam in a well-ventilated area that is out of the way until the scents dissipate. Finally, the cost is always a major consideration when people are buying anything. I would like to stress that you should not skimp on getting the best gel mattress topper because it is too expensive. A good mattress pad will give you several years of quality sleep. Can you really put a price on that? That said, the price is not everything. Just because a mattress topper is more expensive, that does not mean that it is better. So, do your research. Lucid has their own gel technology that is infused into a memory foam mattress to capture and dissipate body heat to provide a cool sleeping experience. This mattress pad has two layers: two inches of soft down alternative and two inches of convoluted, gel-infused memory foam. You can alternate the convoluted or smooth side of the removable gel foam layer or invert the topper to adjust your level of support and softness. There are consistent breathability and loft in the down alternative layer thanks to the box-stitched construction. And, the memory foam has improved temperature and airflow due to the convoluted design. You might consider this topper if you have a little extra money to spend. 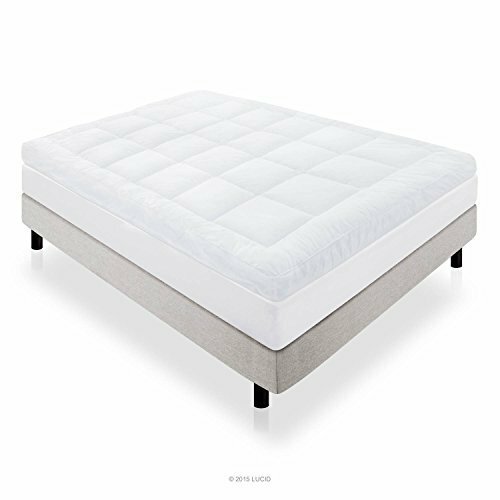 This topper is 100 percent gel-infused memory foam to offer superior pressure relief and comfort. This will reduce your tossing and turning at night while improving your circulation. The viscoelastic memory foam is resistant to bacteria, allergens, dust mites, and mold and is anti-microbial. As with other gel memory foam items, the Abripedic 2.5” Thick Gel Memory Foam Mattress Topper conforms quickly to the pressure and weight you apply to it. This pad has three-pound density. And, it comes with a three-year warranty. You should consider this mattress topper if you often suffer from back pain when you wake up in the morning. This should relieve it. The Novaform 3” Gel Memory Foam Mattress Topper is brought to us by Sleep Innovations. They specialize in a number of bed and bath products. Their Novaform line consists of premium memory foam sleep products from mattress toppers to pillows and mattresses. This particular mattress topper is covered with 100 percent Egyptian cotton, which ensures that the memory foam is breathable and stays cool. It also keeps pressure off of your joints to reduce tossing and turning in your sleep. I would recommend this mattress topper to those of you who may be concerned about spilling on your bed since it has special stain-release technology built in. An excellent way to add the comfort of memory foam to your existing mattress is with the Ultimate Dreams 2” Gel Memory Foam Topper. As with other gel memory foams, you avoid the extra warmth associated with memory foam thanks to the gel beads infused into the topper. This gel memory foam topper has a four-pound density and a thickness of two inches. The pad also comes with its own cover, so you can keep it clean easily. It is made in the United States. Due to how thin it is, I might recommend this topper to those of you who have a thick mattress or who are relatively light. You may have trouble getting the support you need if you are on the heavier side. Furinno, short for Furniture Innovations, has only been around for a few years, but they have already made a name for themselves with their budget-friendly home furnishing solutions. This gel memory foam mattress topper is one of the most affordable options on the market. This pad conforms to your hips, head, back, shoulders, and neck to provide pressure point relief and spinal alignment to ensure a quality night’s sleep. This mattress topper is also dust mite resistant and hypoallergenic. You should consider this topper if you suffer from allergies. All of the above options are great, but you really need to do your own research to determine the best gel mattress topper for your purposes. This guide should give you an excellent start in your search. Good luck!